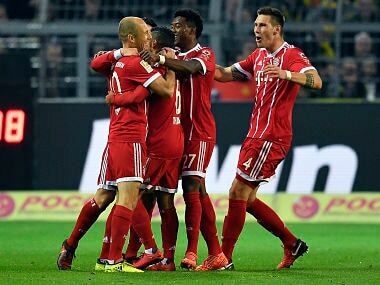 Berlin: Bayern Munich stamped their authority on the Bundesliga on Saturday by opening a four-point lead at the top of the table as Robert Lewandowski netted an audacious goal in their commanding 3-1 win at Borussia Dortmund. 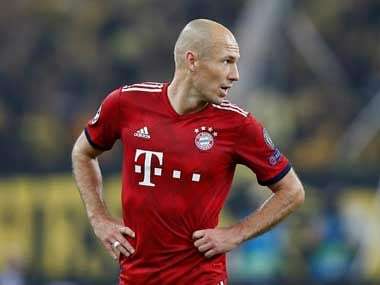 A superb curling strike from Arjen Robben put Bayern ahead on 17 minutes and a cheeky backheel from Lewandowski deflected off a defender on its way in to make it 2-0 eight minutes before the break. David Alaba put the game beyond Dortmund midway through the second half as his cross found the net after just evading Lewandowski in the area. Marc Bartra, the defender who was injured in April's bomb attack on the Dortmund team bus, scored the hosts' consolation goal two minutes from time. 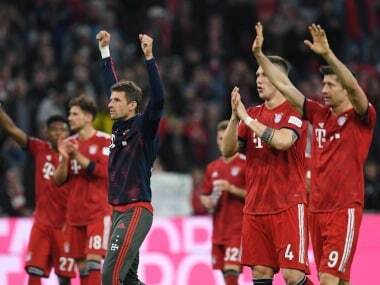 Bayern, the defending champions, stay on course to win the title for a sixth straight season as they leave RB Leipzig behind in second, while Dortmund are now six points off the pace in third. "Both teams had good chances, but we managed three goals and proved we are in good form," said Lewandowski. "Josh (Kimmich) spotted I was alone in the area and put in a good cross, it's my job to finish chances like that." Having missed Bayern's 2-1 win at Celtic on Tuesday in the Champions League with a thigh injury, Lewandowski's goal was his 11th in the league in as many games this season. He is currently the Bundesliga's top scorer. Dortmund's Pierre-Emerick Aubameyang, the top scorer last season in Germany just ahead of Lewandowski, has now failed to score in each of his last five games, although he still has 10 for the season. The win leaves Bayern unbeaten in their seven games since Jupp Heynckes returned as coach at the end of September. 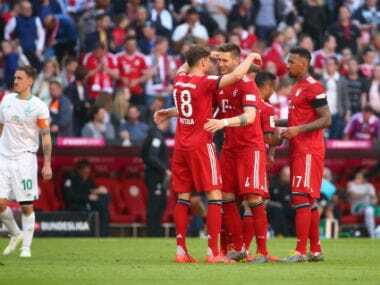 "We played outstanding football in the first half, even though Borussia Dortmund also had very good chances," said Heynckes. "(Bayern goalkeeper) Sven Ulreich kept us in the game and I must compliment my team, that was a great performance." Dortmund have now won just one of their last seven games in all competitions, a miserable run which has seen them surrender a five-point lead over Bayern in the league. RB Leipzig earlier climbed into second as they came from behind to beat Hanover 2-1. Germany striker Timo Werner, 21, who has just recovered from a neck injury, proved his form ahead of the world champions' high-profile friendly matches against England and France in the next 10 days. Werner set up Yussuf Poulsen's equaliser and then netted an 85th-minute winner after the Brazilian Jonathas had given Hanover the lead at Leipzig's Red Bull Arena. The result got Leipzig back to winning ways after last week's back-to-back cup and league losses to Bayern and a 3-1 defeat at Porto in the Champions League. Elsewhere Schalke, who are now undefeated in their last six games in all competitions, climbed to fourth, level on 20 points with neighbours Dortmund, with a 1-0 win at Freiburg. Mid-table Augsburg and Bayer Leverkusen shared the points in a 1-1 draw as Kevin Volland's strike just after the break was quickly cancelled out by Austrian defender Kevin Danso.